The old adage says, “Behind every great man is a great woman!” Wives hold the key! Song of Songs 7:6 and 13 tell us to bless our husband with charms that are “both new and old.” Are you in the “old” rut? Try a “new” road! Spice up your marriage and spend some time thinking about some new ways to delight your husband. God intends you to have fun together. Boot boredom out the door! Open the door to love and excitement. Be amazed at what will happen. Husbands are desperate for love and encouragement. Maybe your husband didn’t receive all the encouragement he needed as a child. Maybe your husband is still lacking and his confidence tank is not yet filled up. You can fill up that lack in your husband. You’ll be amazed at what happens to him when he gets filled up. Proverbs 12:25 says, “A word of encouragement does wonders.” Look out! When you start encouraging your husband, wonders will happen! In this electronic book compiled by Nancy Campbell you will find over 124 specific ideas to fire up your marriage--golden nuggets of wisdom shared by women from different countries of the world. In this e-book are 15 chapters of practical everyday tips to bless your man and lay the foundation for an exceptional marriage. Get your digital e-book copy today and learn these time honored secrets to revitalize and strengthen your marriage and family life. This is an electronic book in .pdf format. 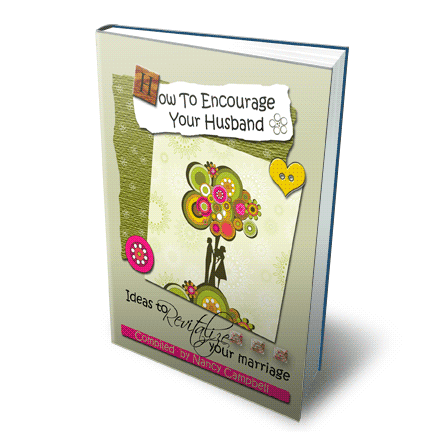 Once your order is confirmed you'll receive an email with a link to download your copy of "How To Encourage Your Husband - Ideas to Revitalize Your Marriage" in .pdf format. This book is compiled of advice from women around the world who have experienced marriage and learned some practical, positive things that can be done to encourage and support, instead of put down, their husbands. My personal marriage has been difficult from the start but just days after reading this, through tears and prayers, I can see my husband more happy already. I had to change my attitude and tell myself to try again. One thing also that I did was write down the personal application of the womens' points in my daily planner to try something each day. It's worth the money and time to read. There are not many books to encourage your marriage...this is one book that has a DAILY word from two different women that will give you a new vision for encouraging your man. Click the button below to add the How To Encourage Your Husbands - Ideas To Revitalize Your Marriage - Electronic Version to your wish list.